On the infamous day that the great Spanish writer Miguel de Cervantes died, it was only fitting that a lecture on his greatest work, “Don Quixote,” was held. This is what occurred on April 23 in Manhattan College library’s Alumni Room, where Dr. Ana María Laguna, associate professor of Spanish at Rutgers University-Camden, spoke about “Don Quixote” and its reflection on elements pertaining to the visual culture of Spain. The event was hosted by Spanish professor Dr. Joan Cammarata, who introduced her longtime friend Laguna to an almost full room. 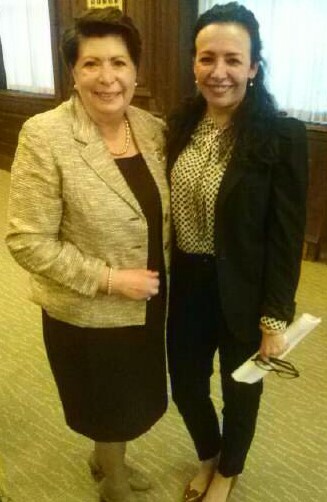 Dr. Joan Cammarata (left), host of the Cervantes lecture, joined by Dr. Ana María Laguna (right). Photo by Daniel Ynfante. “I’m going to be asking you some questions. I hope it is okay with you. Did you have some coffee?” she joked. Laguna began her lecture by arguing that not much has changed from the sixteenth and seventeenth century until now, in regards to the importance of visuals in art. Even in Cervantes’ time, people had a “see it to believe it” mentality, which Laguna believes put writing at a disadvantage against images. Naturally, words did not create as clear a picture as a painting did, so writers had to invoke poetic and descriptive language in their works, in order to keep readers interested. To Laguna, this was something Cervantes was able to do masterfully in “Don Quixote.” Cervantes was able to take beauty, an important concept in seventeenth century Spain, and expand upon it through some of his characters. Marcela, for example, was a beautiful woman, whom many men had fallen in love with. On the other hand, Dulcinea, who at first was also described as beautiful by Don Quixote, was actually a hideous woman. Readers find this out through Don Quixote’s squire Sancho Panza, who describes Dulcinea as the polar opposite of Marcela. Further supporting the importance of visual writing, Laguna brought up the notion that many seventeenth century painters resorted to poetry to receive their inspiration for their drawings of women. “What [the painters] did was to go to poetry,” Laguna said. It is for this reason that many painters drew similar images of women. They obtained an idea of what “the perfect woman” looked like by reading, and they ended up depicting them in related fashion. Laguna then touched on visual art in regards to the narration of history. People in the seventeenth century became distrustful of historical accounts, and so writers had to find a way to make people believe that what they were saying was accurate. In order to do so they created very detailed narrations where people were captured and were almost transported into the world of the writing. Laguna kept true to her promise of an interactive lecture by calling on members of the audience to read certain passages from her power point presentation. Concluding her lecture, Laguna fielded questions from the audience.